STACY IGEL: Midnight Inspirations: Meet our December Muse of the Month, U edition! Midnight Inspirations: Meet our December Muse of the Month, U edition! 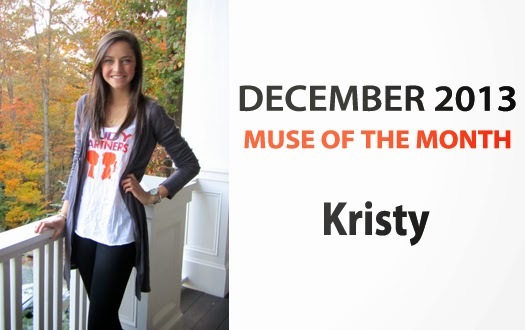 Introducing our December ‘13 Muse of the Month, U edition- Kristy! I cannot believe this is our last MUSE of the year! It has been such a pleasure introducing you to these incredible muses over the past few years. Each muse has their own story and inspire me and my team. I am excited to introduce you to our new category Muse of the Month...the University(U) Edition. Check out Kristy from Clemson University and learn more about her below and why she loves Orange! After graduation, I hope to be a fashion buyer or do Marketing Research in the Fashion industry. I have danced ballet my whole life, and love any type of dance, from classical to zumba! What do you wear to show your school spirit but stay fashionable at the same time? I love to accessorize with scarves, they can really make an outfit especially in chilly fall weather! I have so many orange scarves that I wear around campus on our Solid Orange Fridays.